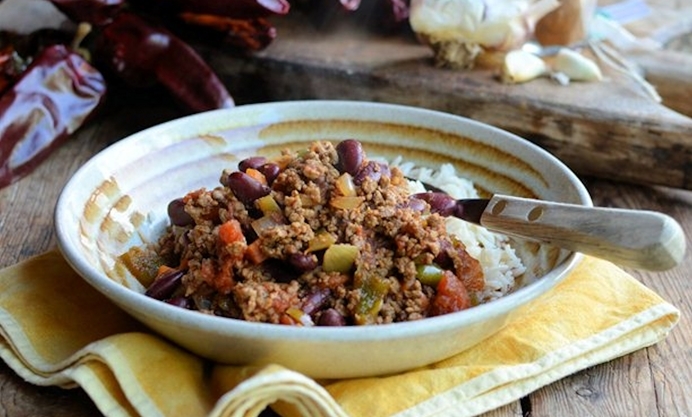 Chilli is perfect comfort food for a damp, cold evening. Karen shows how you don't need to avoid it on a diet. One very generous serving of this smoky chilli with vegetables and beans comes in at an incredible 220 calories per portion or 420 calories with steamed rice. I love a big bowl of steaming hot chilli during the winter months, and I do miss it when I am on a diet, as my chilli usually consists of big chunks of beef with melted chocolate and masses of mixed beans; each bowl of chilli is then topped with some sour cream, tortilla chips and grated Cheddar cheese……and, no need for any rice as we all tear into large crusty loaves of bread as an accompaniment. So, it’s obviously a very calorific dish and although it is a wonderful meal to cook and serve for a large gathering, it’s not that energy efficient or practical to cook for just the two of us, and it is not the dieter’s friend either! So, how to feed my chilli addiction whilst on a diet? (I follow the 5:2 diet, with two low calorie “fast days” of 500 calories and five days of normal eating, but not to excess) It was obvious the best way to satisfy my chilli cravings was to devise my own low-calorie version, which I have done and very successfully too. I swapped the minced beef for Quorn, which is a faux meat mycoprotein made from the fungus Fusarium venenatum. It doesn’t sound very appetising, but in actual fact I love Quorn and when I visit my parents, who are vegetarian, I eat it a lot……in all sorts of meals and recipes. As well as swapping the minced beef for Quorn, which is much lower in calories and fat than beef, I also added lots of extra vegetables in the form of carrots, tomatoes and green peppers, as well as the usual tin of kidney beans. I used a large onion and several cloves of garlic for flavour, and the ground chilli of choice was some dried Chipotle chilli powder, which has a pronounced smoky taste and packs a bit of a punch too. Dried Chipotle chilli powder is made from the chipotle chilli, which comes from the Nahuatl word “chilpoctli” meaning "smoked chili" and is a smoke-dried jalapeño chilli pepper. The Chipotle chilli is used primarily in Mexican and “Tex Mex” cuisine, and is a favourite ingredient of mine. 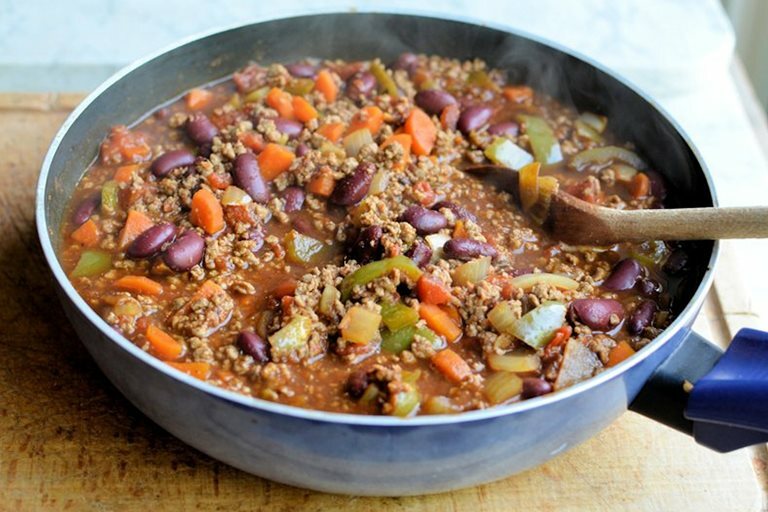 The smokiness adds a real depth of flavour to this chilli and added ground cumin and coriander add fragrant warmth to the dish, which enhances all of the other ingredients. Despite the lack of meat in this recipe, it is a hearty, robust dish that even carnivores will like, and I know as I have tested this out on some! You can serve this recipe with sour cream, grated cheese, tortilla chips and bread on a non “fast-day”, or it is just as tasty by itself or with a small portion of steamed rice, as I served it today. One very generous serving of this Smoky Chilli with Vegetables and Beans comes in at an incredible 220 calories per portion or 420 calories with 125g of steamed rice. It’s just the meal to serve on a damp, cold evening and I am sure all the family will love it!